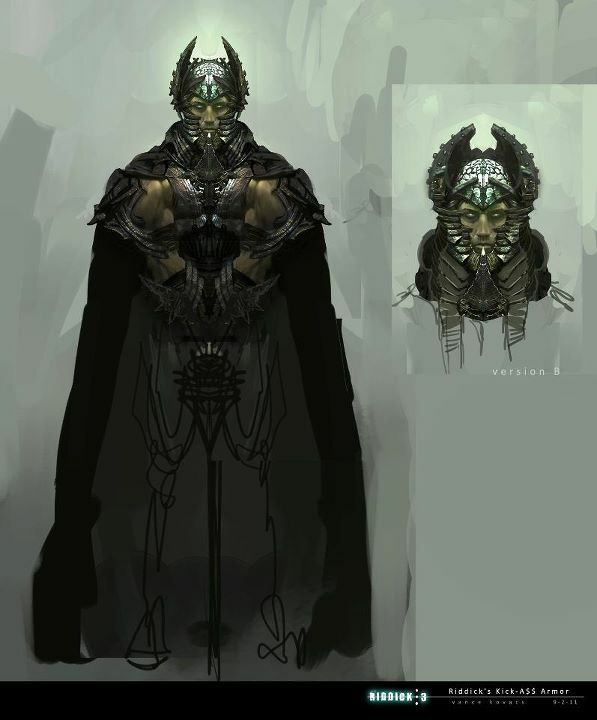 For a little while now, Vin Diesel has been sharing concept art for the upcoming third instalment of the Riddick series through his Facebook page, and if you’ve missed out on what he’s given us so far, you can catch up on all things Riddick-related here. He’s now sent out a new piece showcasing one of the Necromonger armour designs, and it’s looking pretty menacing, as expected. After the success of the first film, Pitch Black, a huge amount of money was thrown at the film – the budget increased from $23m. to north of $100m. – and sadly the studio didn’t quite see the return it was hoping for. As such, this third film, currently titled simply Riddick (I’m loving the name), has been a long time coming. It’s set to be on a budget more in keeping with Pitch Black, which is good news, because it no doubt allows writer-director David Twohy and leading man Diesel more freedom to make the movie they want to make. One that’s going to be R-rated, as Diesel’s been looking forward to as he’s said in his posts online. “One of many Necro-armor designs… Haha, I had to share. It takes hundreds of artists to make a movie… I am excited about the work Our “Riddick” crew of artists, are doing right now in Canada. Their contributions is what will make this film. It’s that second-last line that catches my attention most. Riddick starts principal photography in weeks! Which is just awesome. I think a lot of people, no doubt at times including Twohy and Diesel, were a little sceptical, or at best quietly optimistic, about the possibility of another sequel. But over the past few months especially, it seems to have been shaping up nicely. Most recently, we’ve been hearing word that Karl Urban might be returning to reprise his role from the second film, The Chronicles of Riddick, as Necromonger Commander Vaako, which would be pretty interesting. Back in May, Diesel said that he hoped filming could get underway for Riddick in the summer, and it looks like that initial schedule was very close to spot-on, with filming now imminent. It could well be early 2013 before we get to see the final product, but already I can’t wait. Game on. Until then, and without further ado, here’s the new concept art to enjoy. As usual, click to enlarge.